A wanna be Santa’s helper? I finally finished my ‘original’ design primitive Santa! Too late for my Christmas in the Country Open House, but still in time for the Christmas season, never-the-less! 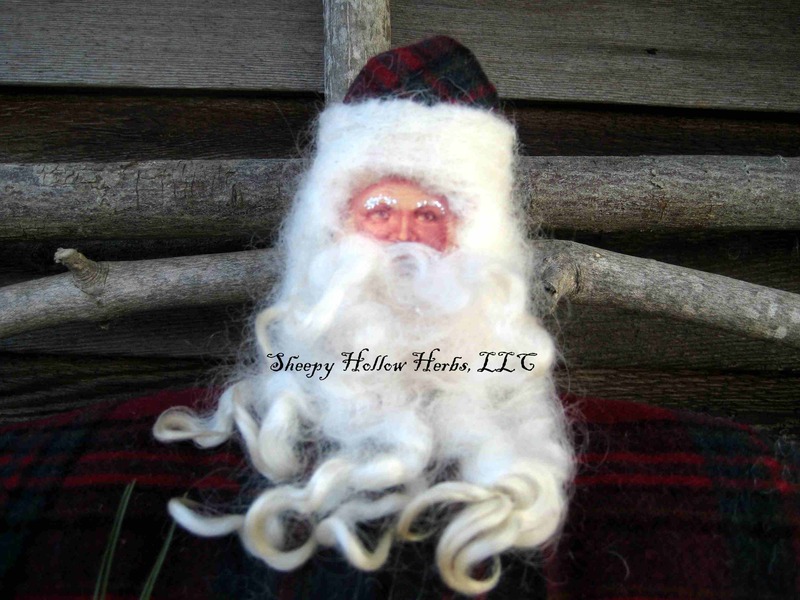 Prim Santa is made of 100% wool, red & green plaid suit trimmed in wool fleece – that’s my Cheviot wool fleece! He has rusty bells stitched onto the corners of his ‘coat’, twig legs, (it’s difficult to discern, since Santa is displayed from one of my hand-crafted twig trellis) and is holding a coffee-stained satchel filled with scented rose hips, cinnamon and spices, a piece of wool trim and a rusty mini gingerbread man cookie cutter. 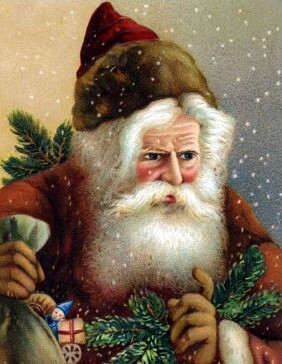 His face is actually repro vintage card ‘paper’ santa. I added a touch of silver glitter to detail his eyebrows. His hair and beard is made with wool locks from a Border Leicester sheep. Their naturally curly locks are often used by doll-makers. I also finished a few Christmas stockings, hand-knitted 100 % wool…for hanging on the fireplace mantle. I needle felted the sheep with my Corriedale and Shetland fleece. 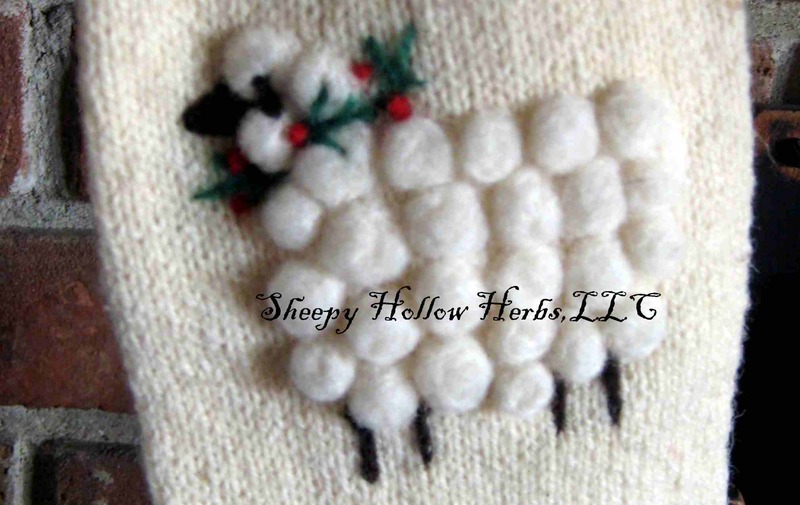 The sheepie is sporting holly sprigs around her neck. 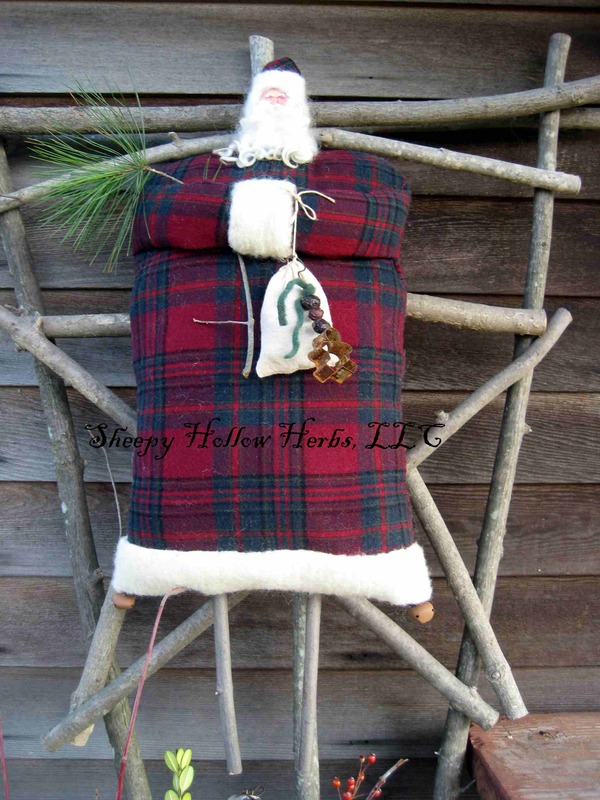 I think I’ll list a stocking or two on my ETSY shop once I figure the appropriate postage. 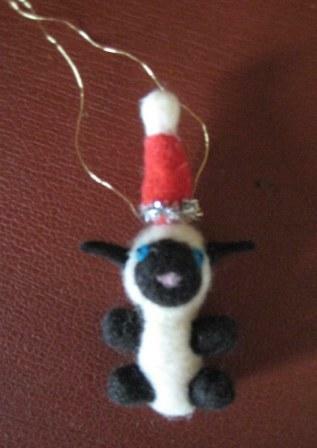 I’ve been needle felting for a very long time and enjoy creating anything sheepie! I love the texture of working with difference wool fleece. How about a few stocking stuffers? Slightly larger, my Moth Beware! 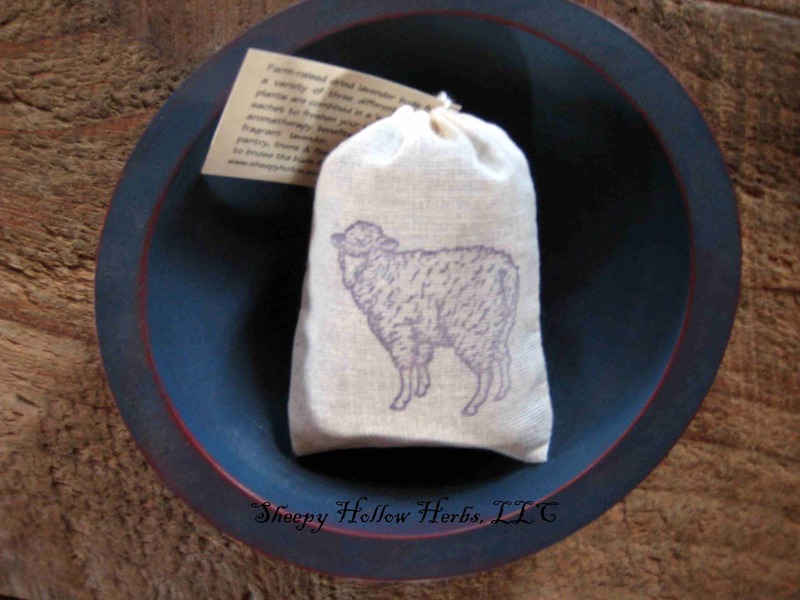 Wool Saver Sachet is filled with fragrant red cedar shavings and a variety of natural moth-repelling herbs raised in my garden such as tansy, wormwood, mint, rosemary, lavender…to name a few. 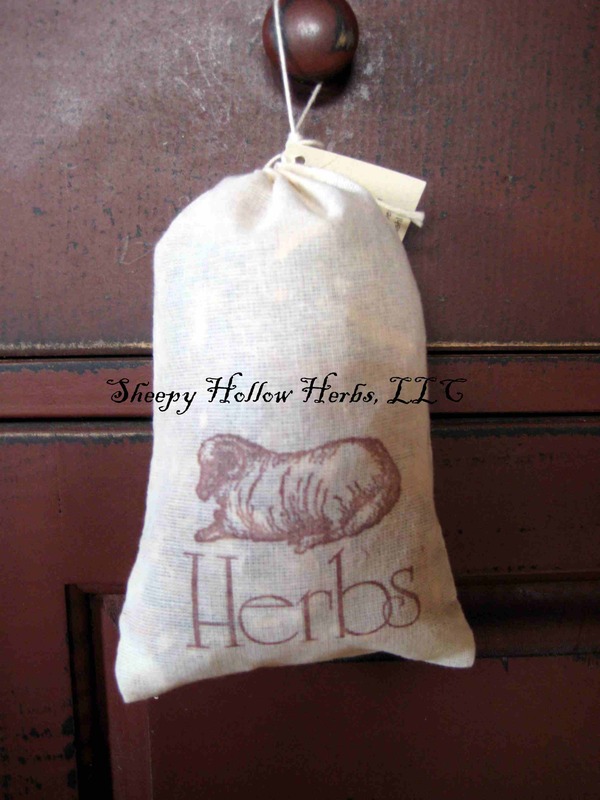 Also hand-stamped with a prim sheepie and ‘Herbs’ motif! These sachets will also be listed for sale in my ETSY store! Well, I’ve been busy knitting up some red fingerless mitts and little red felted bowls, perfect for catch-alls during the holidays!